Msida residents can report irregularities in their hometown and access local council services using a new app available for download for free. 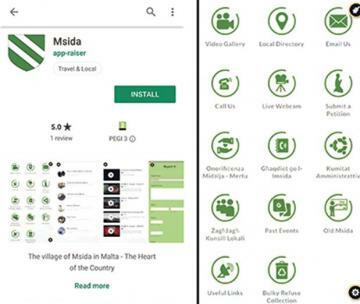 The application, called Msida, is available for download from the Google Play Store for free and will soon be made available on Apple’s App Store too. Two pages from the new app launched by Msida local council. Residents will get notifications with times and dates for garbage and bulky refuse collection. Its directory will offer important local contacts, access to some of the town’s live cams to gauge traffic and weather conditions, as well as information on local events. App developer George Borg D’Anastasi told the Times of Malta that it would bring the local council’s services to residents’ phones with easy-to-use and interactive functions. Mellieħa’s local council recently launched a similar app, and one is currently being designed for the Gżira council too. Addressing reporters, Local Councils Parliamentary Secretary Silvio Parnis said the government wanted to see apps like this rolled out at all of Malta’s councils, to encourage residents to engage with local government. “We really want councils to be a local government that residents can turn to as their first port of call for important administrative matters in their community,” he said. After the upcoming local council elections, the government would be meeting with the newly elected councils to discuss funding and a reform that would see them handed more powers, he added.